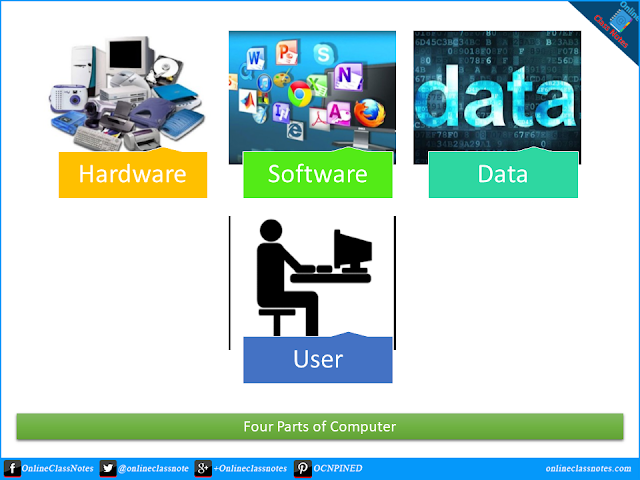 What are the basic four parts of computer. Describe. The mechanical devices that make up the computer are called hardware. Hardware is any part of the computer that can be touched. A computer's hardware consists of interconnected electronic devices that we can use to control computer's operation, input and output. The generic term DEVICE refers to any kind of hardware. Software is a set of instructions that make the computer perform tasks. In other words, software tells the computer what to do. The term PROGRAM refers to any piece of software. Some program exists primarily in the system for the computer's use to help it perform tasks and manage its own resources. Other types of program exist for the user, enabling him or her to perform tasks such as creating documents. Thousands of different software programs are available to use on personal computer. Data consists of individual facts or pieces of information that by themselves may not make much sense to a person. A computer's primary job is to process these tiny pieces of data in various ways, converting them into useful information. People are the computer's operators, also known as users. It can be argued that some computer system is complete without the involvement of a person; however, no computer is totally autonomous.